A South Korean couple have gone on trial charged with allowing their baby daughter to starve to death while they played an online computer game. Prosecutors said they fed the baby once a day and left her alone for hours while they visited internet cafes. They said the couple were obsessed with playing a game in which they had to raise a virtual girl. The 41-year-old man and 25-year-old woman were arrested in March, five months after reporting the death. Last month, a police officer told the Yonhap news agency they appeared to have "lost their will to live a normal life". He said they "indulged themselves online" to escape from reality. The couple, who have been charged with negligent homicide, were said to have become obsessed with nurturing a virtual girl called Anima in the popular role-playing game Prius Online. The game enables players to interact with Anima and as they do so, help her to recover her lost memory and develop emotions. An autopsy showed the baby's death had been caused by a long period of malnutrition. The couple are due to be sentenced on 16 April. The BBC's John Sudworth in Seoul says some lawyers have suggested the couple were addicted to the game, a fact which could be taken into account by the judge. South Korea boasts the fastest average broadband speeds in the world. 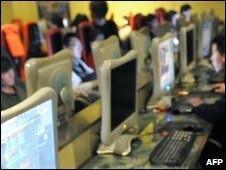 There are some two million internet addicts in the country, according to the government, which recently announced a series of measures to tackle the problem.